I just love trade tokens! 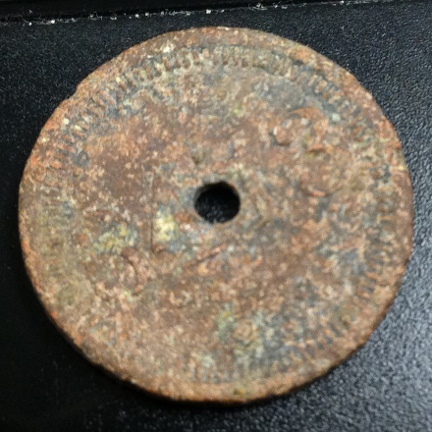 I went looking for silver at lunch time with Maurice –my Deus metal detector, and I found a trade token instead. I thought I had a shield nickel for a split second. My heart did a flip but then my subconscious took over and brought me back to reality. Rubbing off some of the dirt revealed the words around the edge. 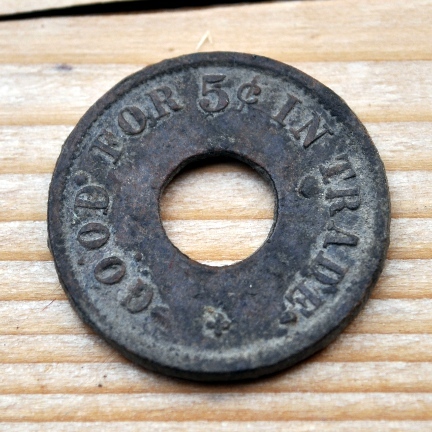 The obverse has the words Good For 5¢ In Trade and the reverse has the number 3413 and nothing else. The token also has a small hole in the middle. The hole seems to be part of the token’s original design as it blends very well with the token unlike holes bored after the production of the piece. The hole is a curious thing though as it cuts through the middle of some of the characters. I wonder what the function of it is. I also wonder what the number on the reverse means. How did the token system worked? Who issued tokens like this with no identifying information? When was this token issued? I found this token where I found the Walking Liberty in the last days of 2012. 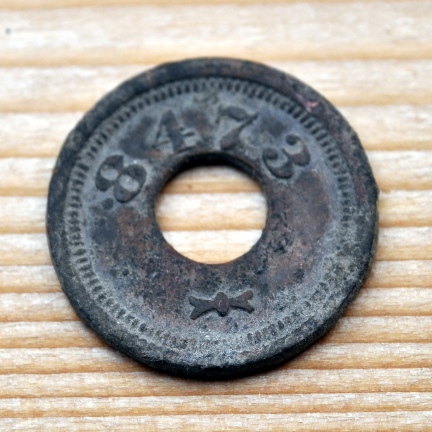 I have found several old tokens there including other trade tokens of a different design. 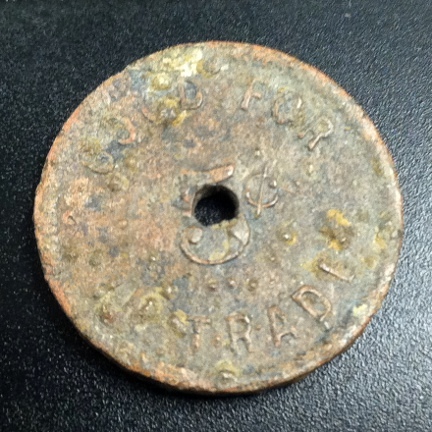 I know other hunters have found trade tokens here as well which leads me to believe that there may have been a store at the site in the past. At any rate, after finding this and other tokens, me thinks more silver coins are hiding at this spot. 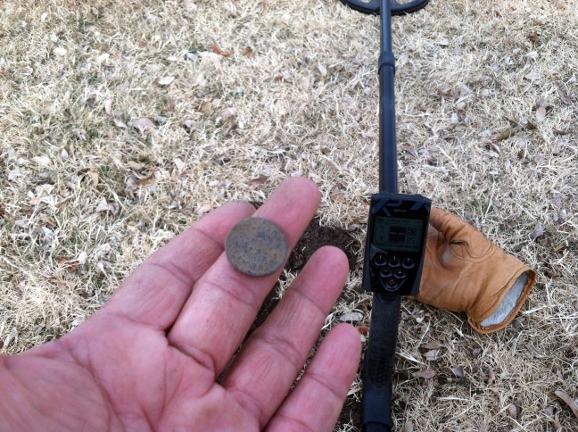 I spent two hours very early this morning metal detecting with the XP Deus metal detector. I returned to the site where I found my very first ever trade token and I found two more of the same except the number in the back was different. 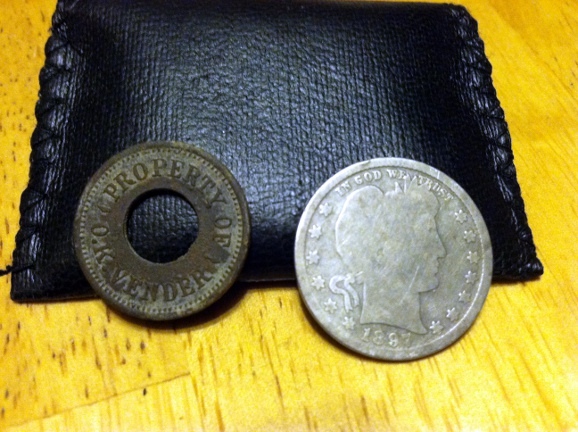 Then I found two additional but different tokens and a numbered lead seal. This leads me to believe that this may have been the site of a store at some time in the past. I found no coins though, at least not yet. The two other tokens are in poor shape. I have seen the Palmolive token many times before so I know what it is for (a cake of soap). 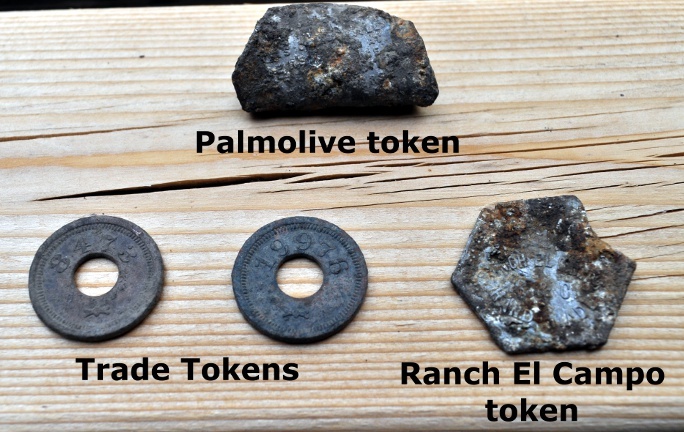 The Ranch El Campo token is a different story. I’ve never seen one before. I found other things at the site including a copper spoon that I broke while extracting it from the hard, dry ground and a number of house parts made of brass and copper. I still have hopes of finding coins there but I may wait for more rain (we got some rain today but not nearly enough).